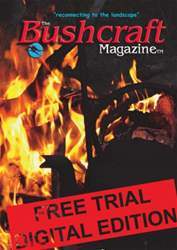 Get your FREE Sample issue of Bushcraft Magazine today! (0 Customer Reviews) | Write Review 4 issues per year Download the app that takes you directly to the heart of bushcraft, bringing you closer to nature by increasing your knowledge of the wild and skill in its ways. Now, wherever you are, whatever device you carry, you can immerse yourself in outdoor living, not just survival, through the tailor-made magazine that is stuffed full of seasonal knowledge and lore. The Bushcraft Magazine has content that is relevant to the UK, Europe, North America and around the world, written by people with the know-how for people with a passion to learn. Now you can carry a veritable encyclopaedia of bushcraft knowledge on your mobile device with all our back issues as they become available, including those that are currently sold-out in paper format. Call up a tutorial at the touch of a button and enjoy extra clarity and an enhanced experience in which you can pan and zoom your way through. It couldn’t be simpler to subscribe to four issues linked to the seasons, which become current again year after year, while your skill sets grow incrementally. There has never been a better way of “reconnecting to the landscape”. A Spring-ralated magazine bursting with bushcraft know-how and wisdom. Download the app that takes you directly to the heart of bushcraft, bringing you closer to nature by increasing your knowledge of the wild and skill in its ways. Now, wherever you are, whatever device you carry, you can immerse yourself in outdoor living, not just survival, through the tailor-made magazine that is stuffed full of seasonal knowledge and lore. The Bushcraft Magazine has content that is relevant to the UK, Europe, North America and around the world, written by people with the know-how for people with a passion to learn. Now you can carry a veritable encyclopaedia of bushcraft knowledge on your mobile device with all our back issues as they become available, including those that are currently sold-out in paper format. Call up a tutorial at the touch of a button and enjoy extra clarity and an enhanced experience in which you can pan and zoom your way through. 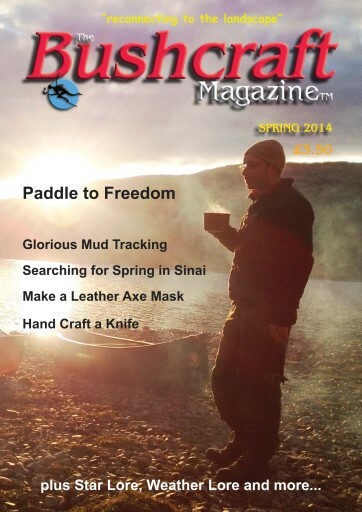 You'll receive 4 issues during a 1 year Bushcraft Magazine magazine subscription. You'll receive 4 issues during a 1 year Bushcraft Magazine magazine print subscription.